WARNING: This post contains major spoilers for book 1 in the Shambling Guides series, “The Shambling Guide to New York City.” If you haven’t read it, go read that instead of this review. It was a great book, though I never wrote an official review. 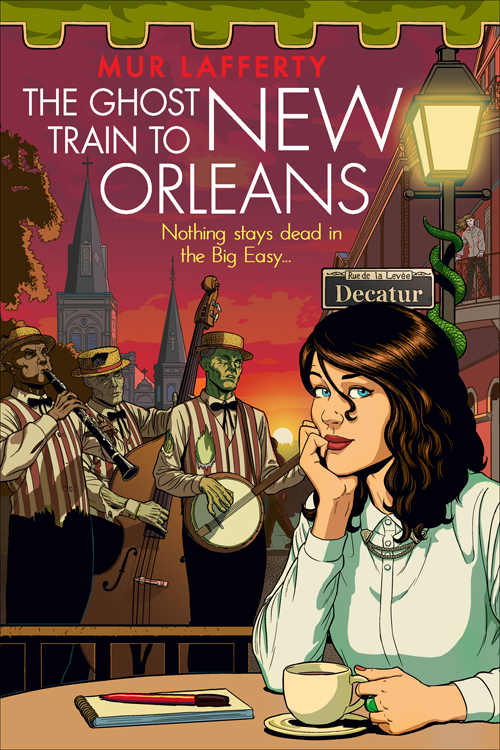 The Ghost Train to New Orleans starts in New York City, not long after the end of the first book. Zoë is trying to figure out her new city talker powers and come to terms with the friends she has lost. Before she has time to do this, however, she is sent away to New Orleans by her boss, to write the second shambling guide. Before she leaves, she goes to talk to Arthur, who is now kind-of her boyfriend. They discover that the medicine he needs to keep him from turning completely into a zombie has gone missing, and they have no way to contact the only person they know who can make more. Thus, Arthur decides to accompany Zoë to New Orleans, where the teacher of the man who made his potion–and possibly the only other person who can make it–lives, if she’s still alive. The group, including several of Zoë’s coworkers, depart on the titular Ghost Train, where Zoë is forced to sit in the human car, a victim of “discrimination”. There, she meets another city talker, and the train is attacked by ghost horsemen. I won’t say much more about the plot, because that would spoil large portions of the novel for you, and I don’t want to do that. Suffice to say, the action starts high, and only continues to ratchet up, right up to the end, which was incredibly tense and well-crafted. While the first book focused on learning the world of the coterie (magical beings that live hidden among us), and that was necessary for our first introduction to the world, this one takes advantage of the fact that we’ve seen much of that already to instead dig deeper into the history of the hidden world, as well as introducing some very interesting characters, both human and not. While the first book also focused heavily on the writing aspect of Zoë’s life–she works for a company that writes guides for coterie who wish to visit the various cities–this volume does most of that off-screen, though we still get little snippets of the guide itself between every chapter. I like that we don’t have to deal with much of the actual writing, though we still have the team dynamics, but I also feel that the little bits of the guide itself that we see are really neat. The ending is adrenaline-filled, and satisfying, though not everything is butterflies and flowers. A warning: While the first book felt like a stand-alone with sequel potential, Ghost Train will leave you begging for the third entry into the series. I hope the wait isn’t too long, and I intend to pre-order my copy as soon as I can. Conclusion: While I don’t normally read urban fantasy, I loved this book. I unabashedly give it five of five stars, and a hearty recommendation. Mur not only talks the talk, she walks the walk. You can find the book here on Amazon and here on Goodreads. Mur’s website can be found here (And if you want to be a writer and don’t listen to I Should be Writing, well… You Should be Listening. ).